Registration is open for UIC’s annual MIE Engineering Summer Camp hosted by the Department of Mechanical and Industrial Engineering (MIE) at the University of Illinois at Chicago, 842 W. Taylor St., Chicago. The July 2017 program at UIC is intended for high school and middle school students. The focus of the camp is a hands-on, immersive learning experience and spending time in a laboratory environment designing projects that are intended to improve the environment and quality of life. The non-residential camp is made up of several tracks, each of which is designed for students of similar age. In each track, students will explore and engage in fun projects about everyday yet important topics such as sustainable energy, biomedical engineering, aerodynamic efficiency, structure and safety, design using software, computer coding, etc. Additionally, students will tour local engineering plants, meet real-life engineers, and learn about the fantastic career opportunities in engineering. It runs from 9 a.m. to 3 p.m., Monday to Friday, and it is broken down into three sessions. 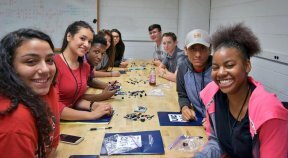 The MIE Engineering Summer Camp is a fantastic opportunity for students to experience life as a student on a Chicago college campus, while also discovering how engineering works. For information, please contact Professor Yeow Siow at yeowsiow@uic.edu. For more information, visit www.mie.uic.edu/summercamp.